I’m starting this year with a quick project using a couple of old items from my stash. Firstly, roughly a metre of upholstery fabric I bought in the Scope shop in Lewisham some time ago, and secondly, an old belt from my wardrobe. I paid £2.50 for the fabric. The two together make quite a nice colour combination. 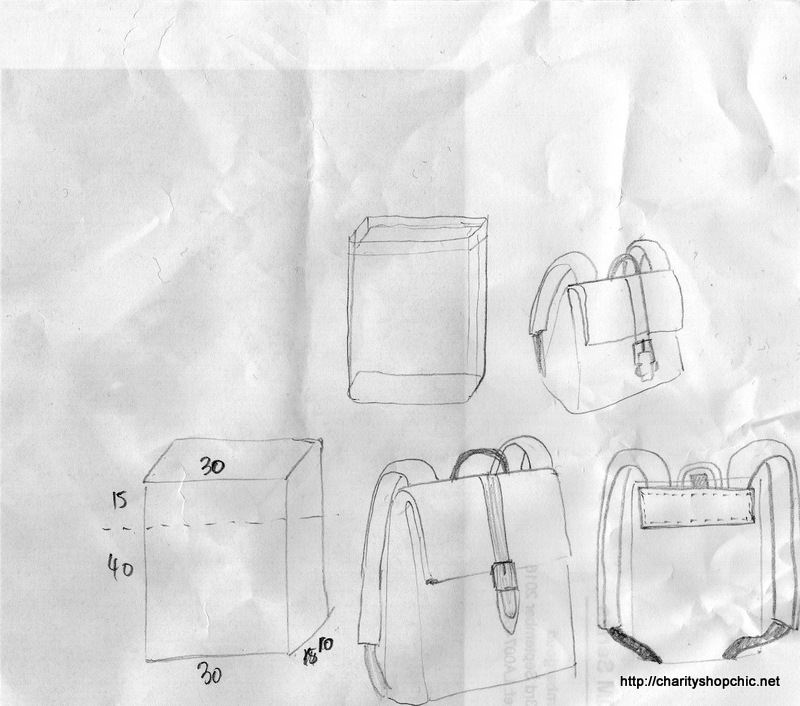 My design for the rucksack had to be fairly minimal since I didn’t have any hardware other than the belt buckle to play with. In the end I went for a simple fold-over design using the belt buckle as the closure and two bits of belt as the lower half of the straps. 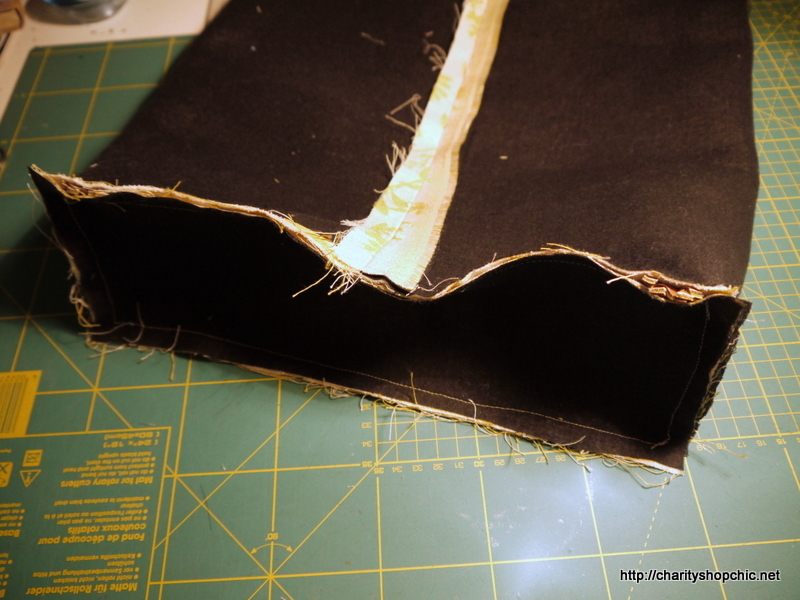 I interfaced the main part of the bag with general purpose interfacing. 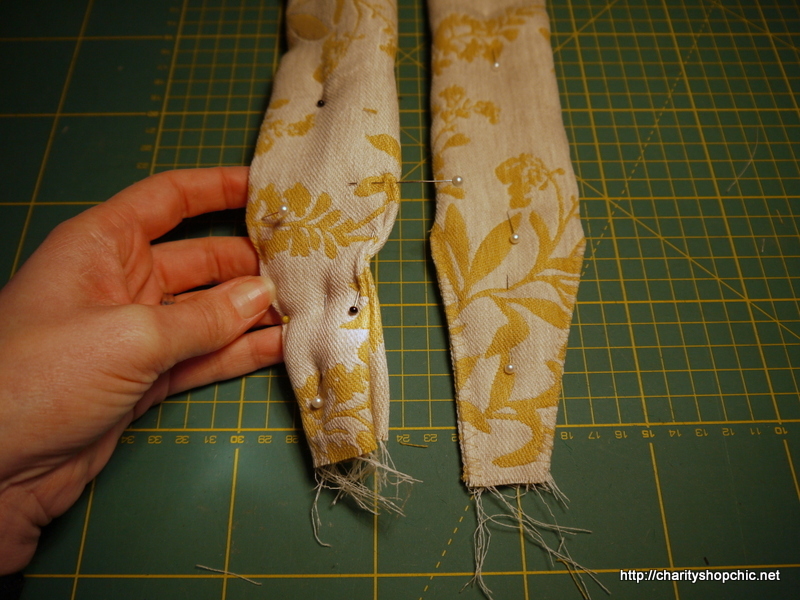 Two bits of belt were inserted into the seam at the bottom, which will join onto the fabric part of the straps. 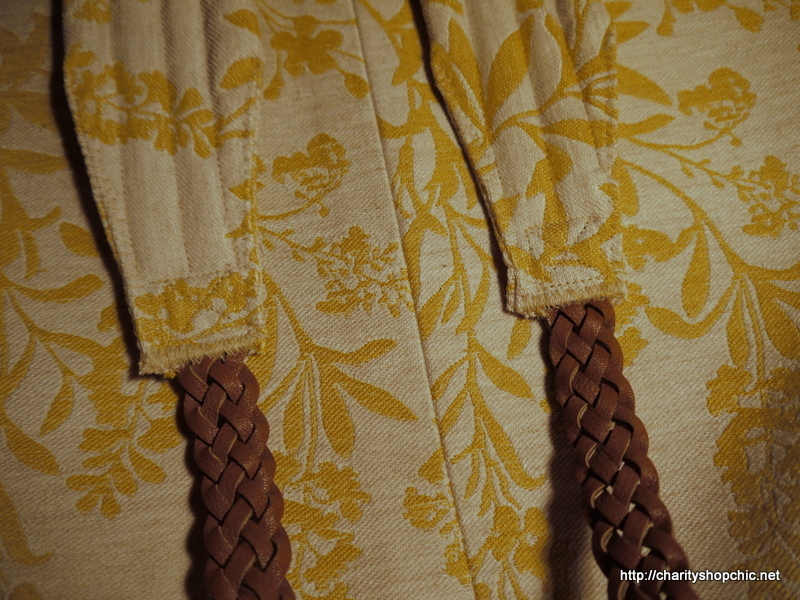 I made a small grab handle from a rectangle of fabric sewed into a tube and then turned, then topstitched a few lines along it. The shoulder straps were harder. 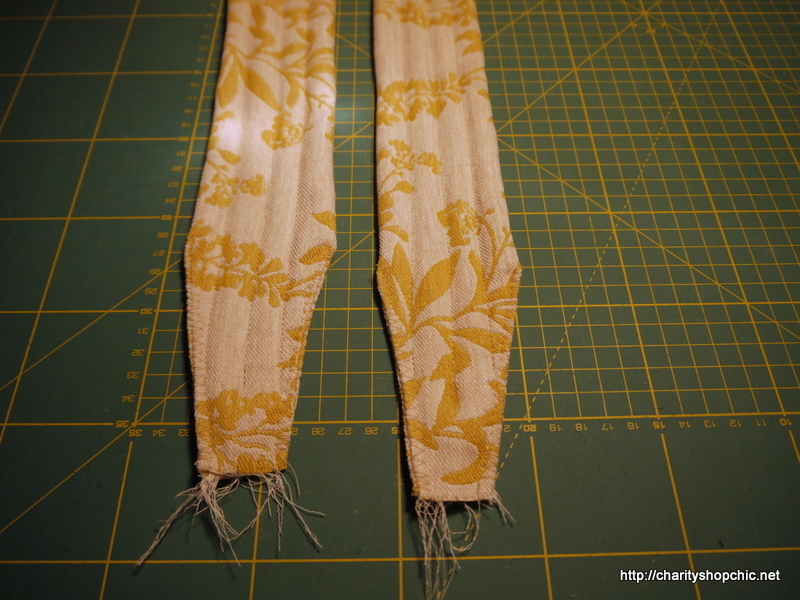 I cut some long pieces of batting in the shape of the intended strap, and some fabric to cover them. 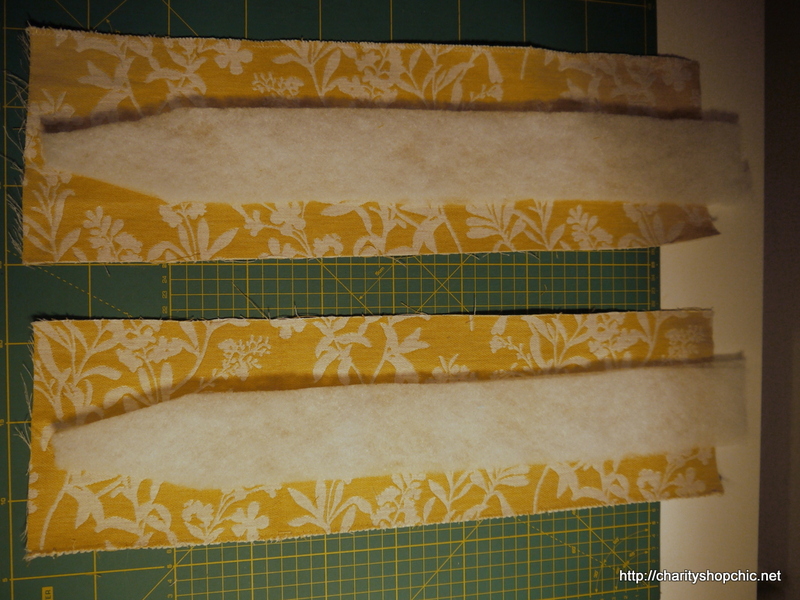 I just topstitched the lot together, folding the sides in where the batting tapered and sealing them with a zig zag. It doesn’t look great, but it works. I added some rows of topstitching for effect. Attaching these to the belt bits was tricky. After inserting the ends of the belt bits between the layers I ended up doing a combination of a topstitching square with a cross in it (what is that called?) 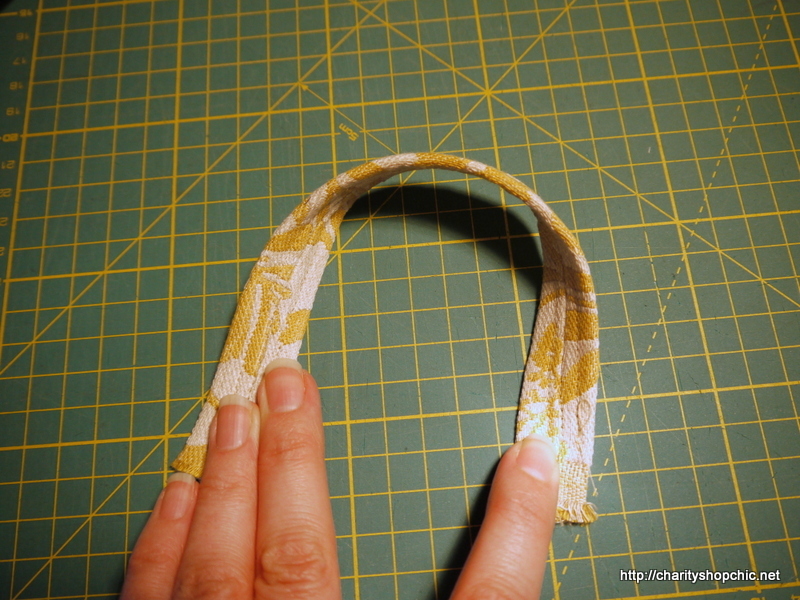 and many layers of zig zag to seal the ends. Again, it’s not pretty, but it works. 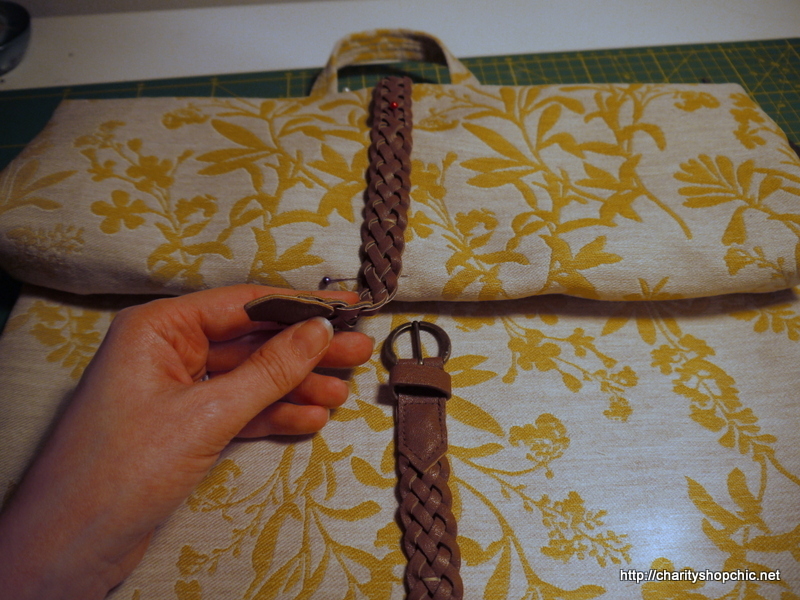 Next I attached the belt buckle to the front of the bag. 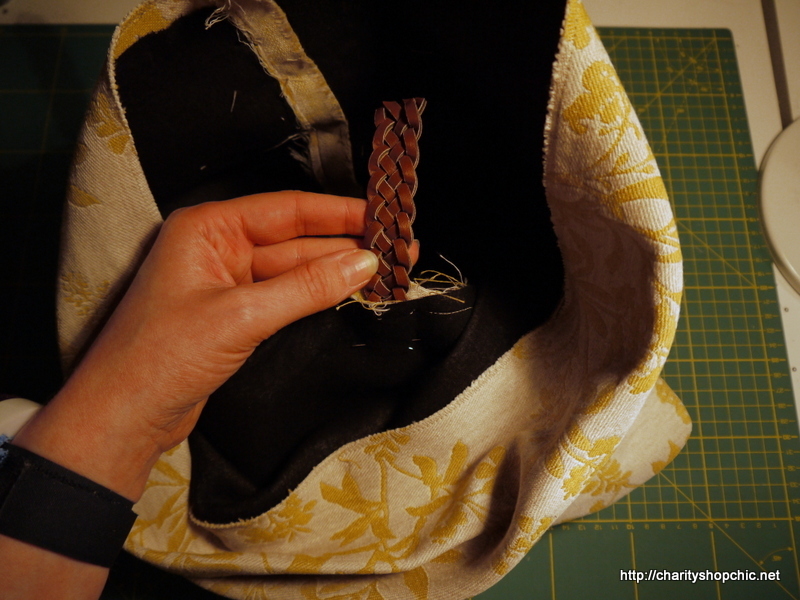 I just added a small hand stitch to hold it in place. 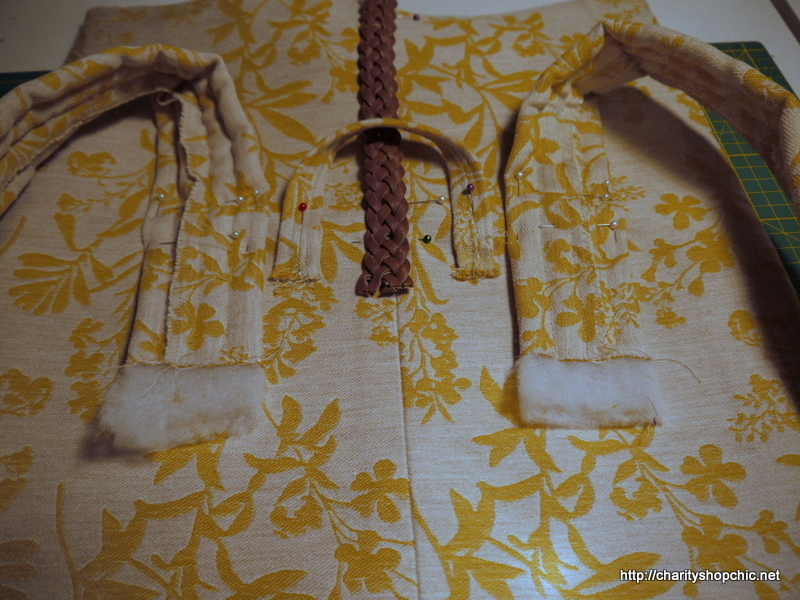 The original idea was to cut off the lower part below the buckle, keeping only the buckle assembly, but I decided in the end that it looked better if I kept the rest of the belt and sewed it on all the way down. 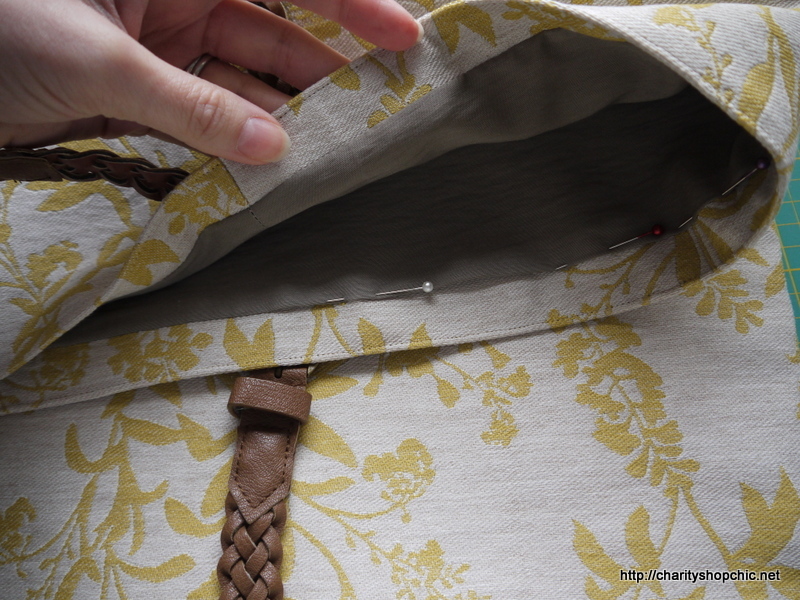 I had to open up a hole in the seam in the bottom of the bag to insert the belt end. I added another stitch to hold the lower end in place. Here it is ready for the addition of the back panel. 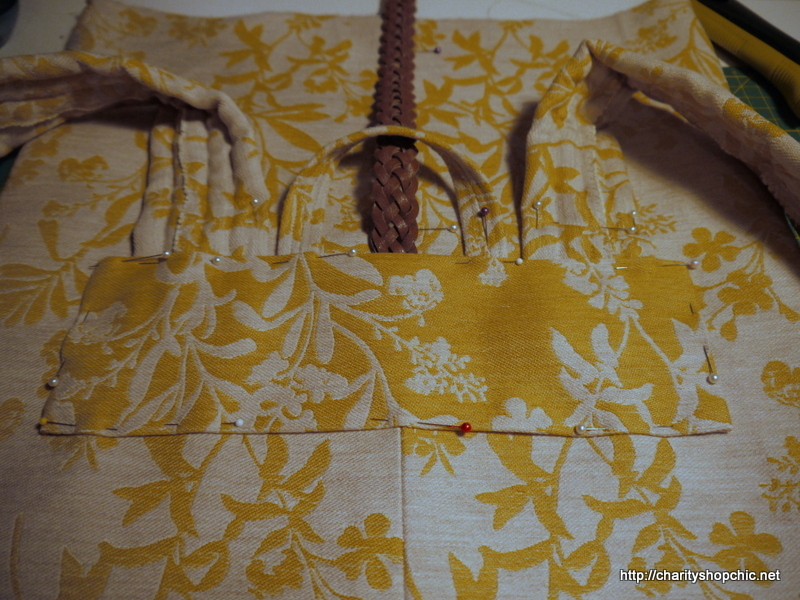 I cut a back panel, which just covers the ends of all the various parts, from the fabric and for fun, added it inside out, so the colours are the negative of the main bag fabric. At this point I decided I did need to add a lining, so I made one quickly out of some unidentified old greige material from my stash. I have had this for ages so was glad to get the chance to use it up. 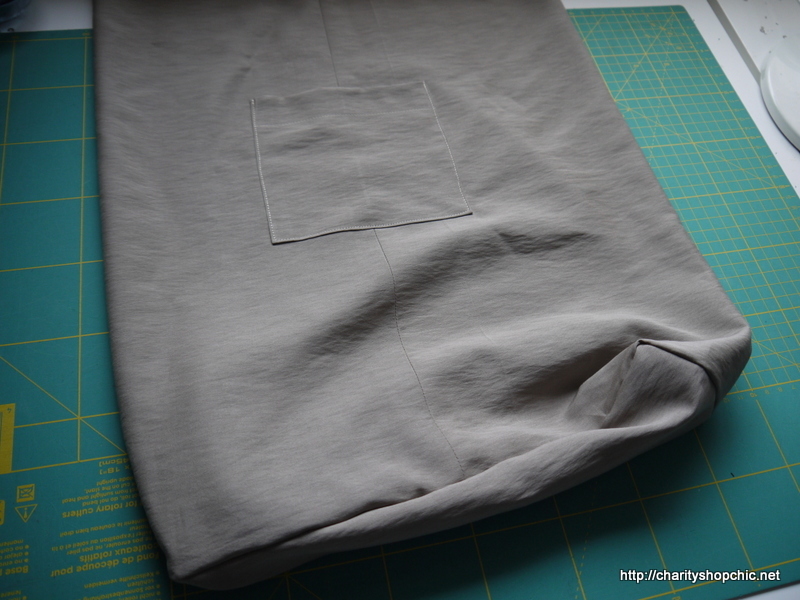 I cut it a bit shorter than my outer bag fabric (about 2-3cm shorter) and sewed them right sides together, leaving a hole for turning. 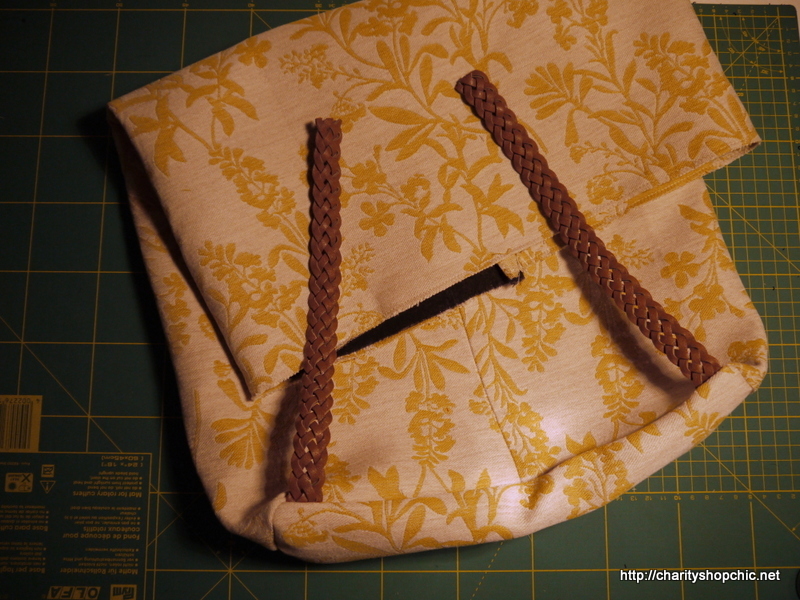 I sewed up the turning hole by hand and topstitched around what will be the bag’s opening. 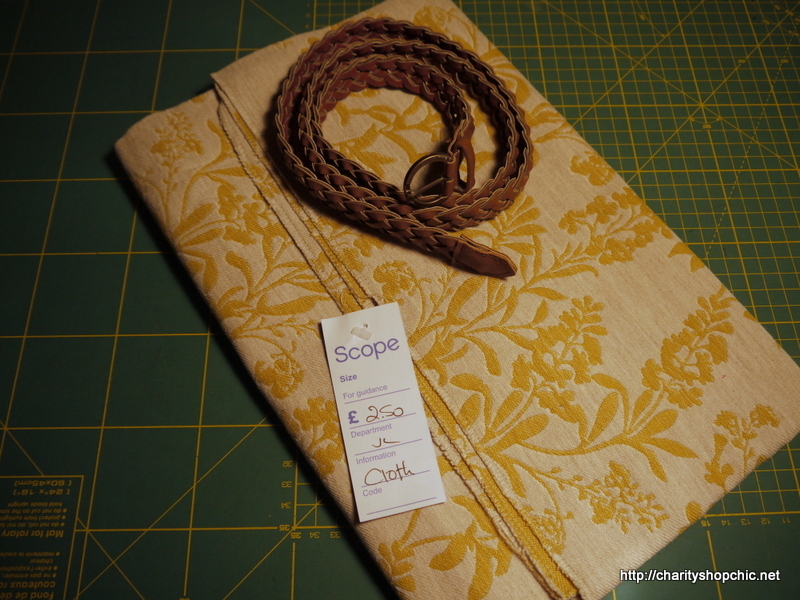 You can see that the bag outer fabric folds about 2-3 cm inside, which I think looks good. 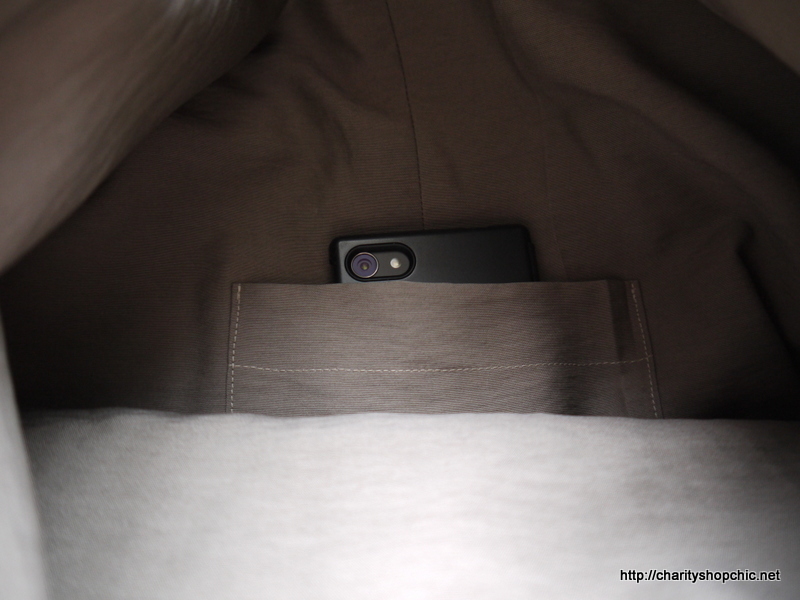 There’s a mobile phone pocket in the lining too. 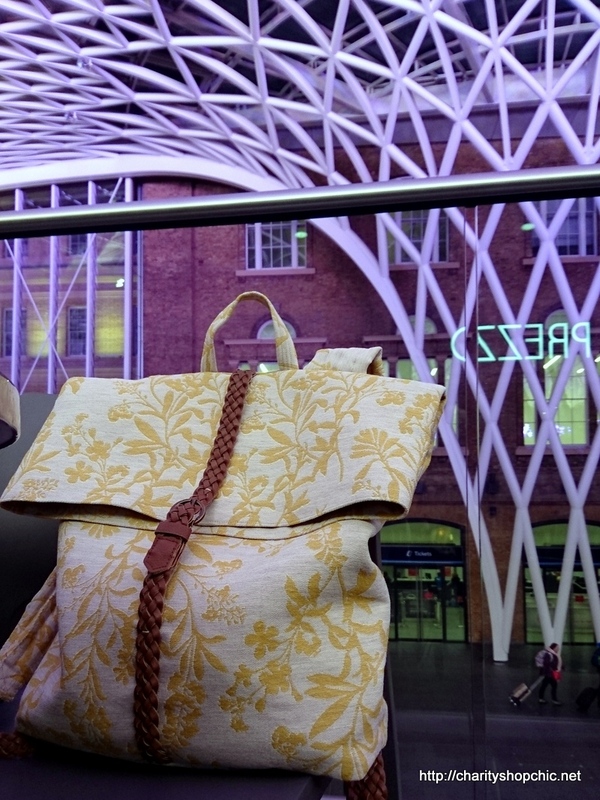 To test my little rucksack’s usefulness and practicality, I took it with me on our trip out of London last weekend. We were up very early and straight down to King’s Cross. 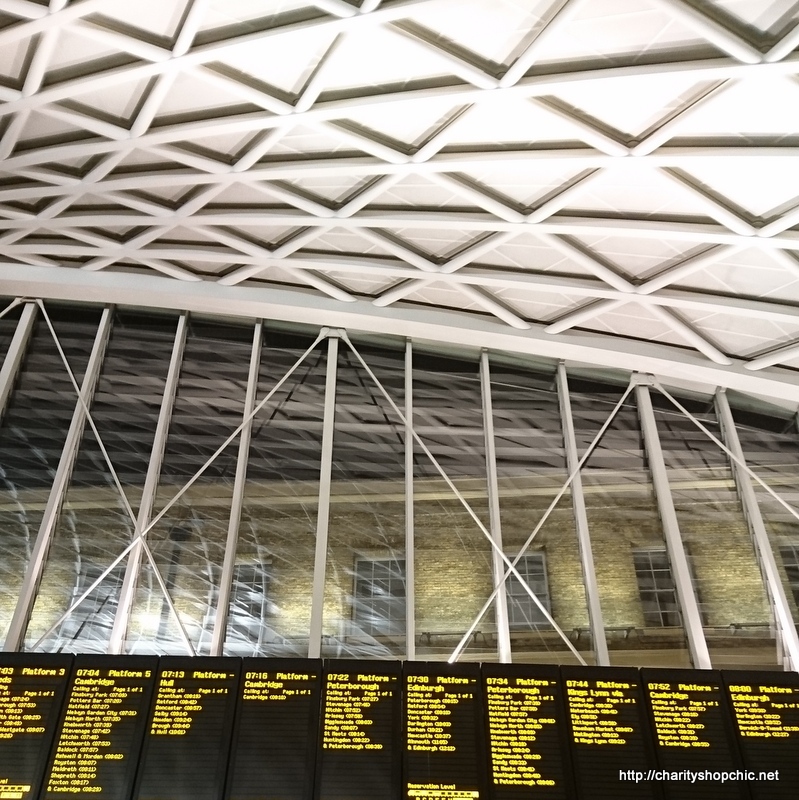 This station is beautiful since its refurb – not quite the British Museum, but the roof is spectacular. 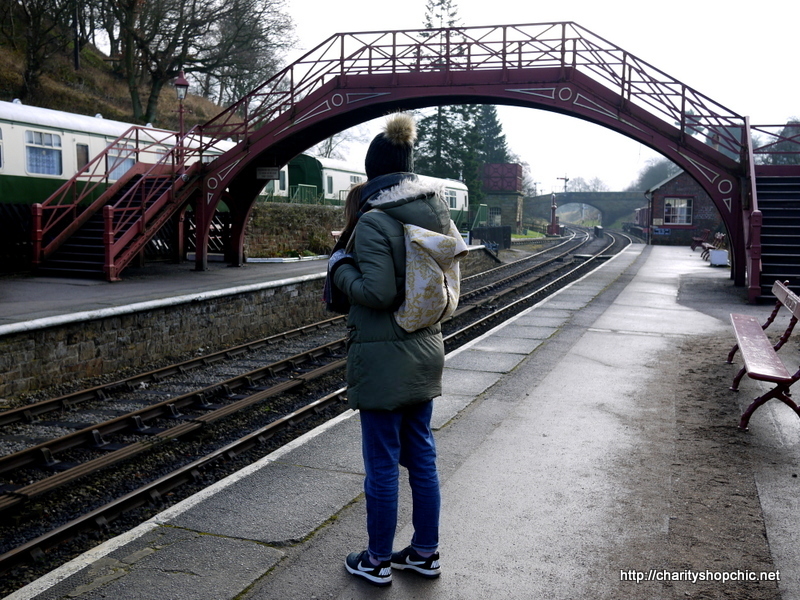 The rucksack had a few overnight bits in it as well as a picnic for when we finally made it to Yorkshire. 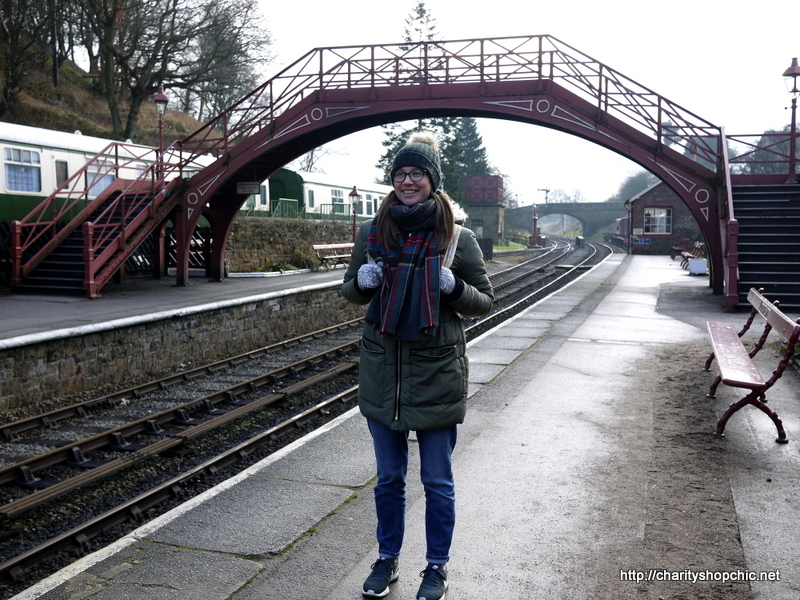 The train journey passed relatively quickly! It was comfortable to wear, although since the straps aren’t adjustable that got a bit annoying if the bag’s contents were uneven. 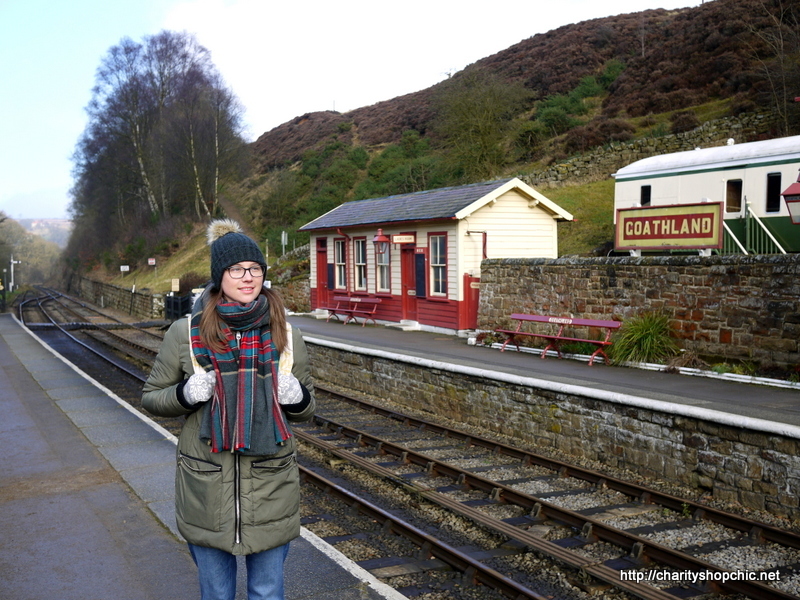 Here we are at Goathland station, which doubles as Hogwarts station in the first Harry Potter movie. It was a bright and sunny day, but cold! 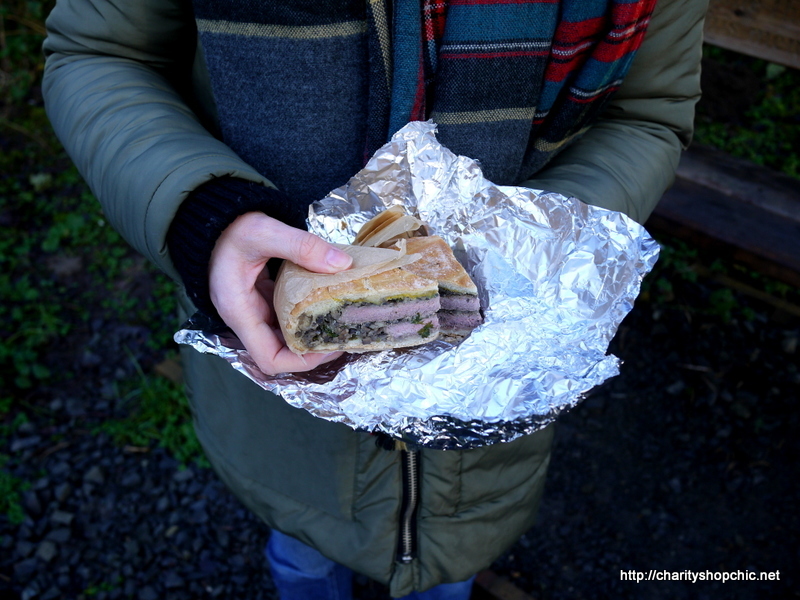 The bag held sandwiches and tea for later. 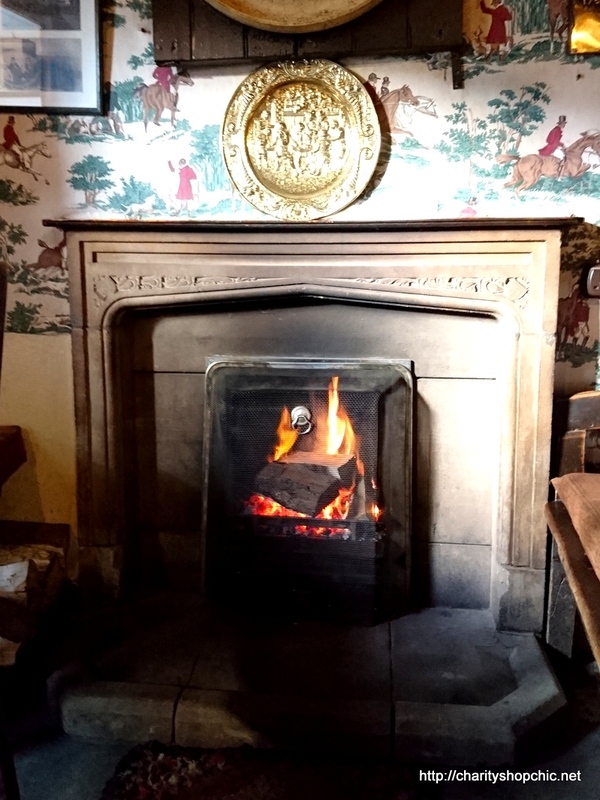 …where we stopped at the Birch Hall Inn for sustenance. 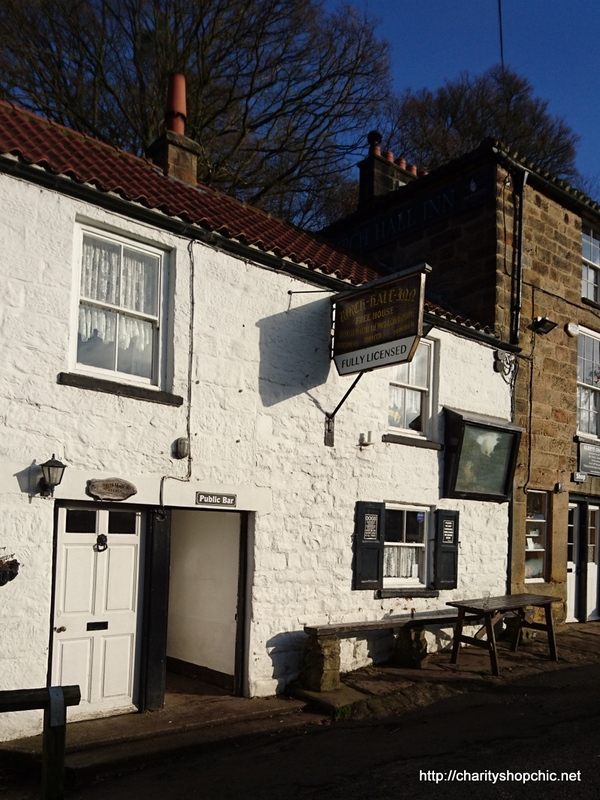 This is a great pub, though it’s absolutely tiny. It’s really old school with beer served through a hatch in the wall (no bar like modern pubs). 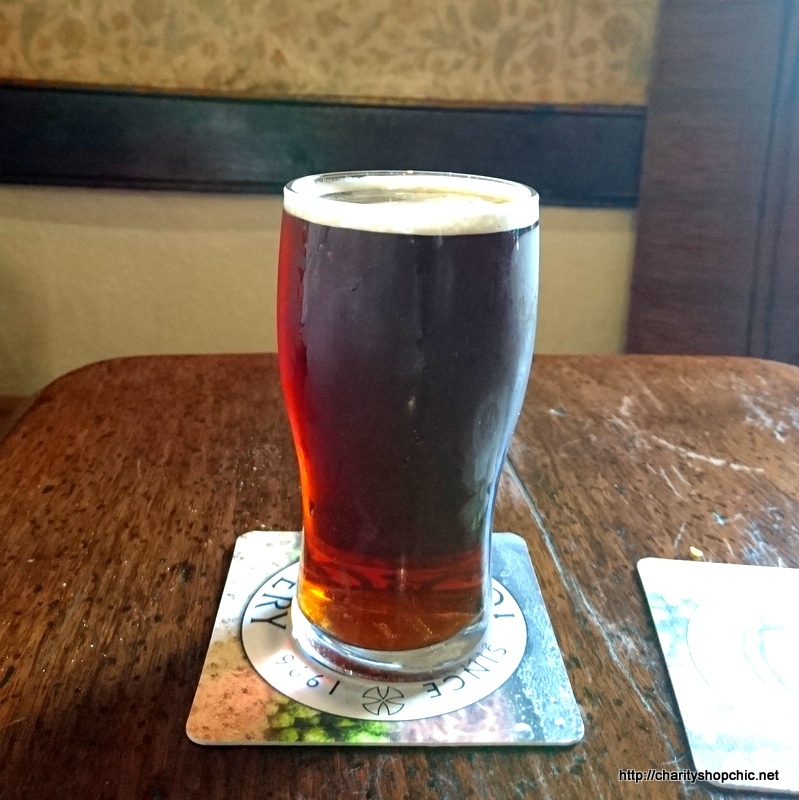 We sampled the local brew, “Beck Watter” (“stream water” – it’s the colour of the stream that runs beside the pub). Delicious. 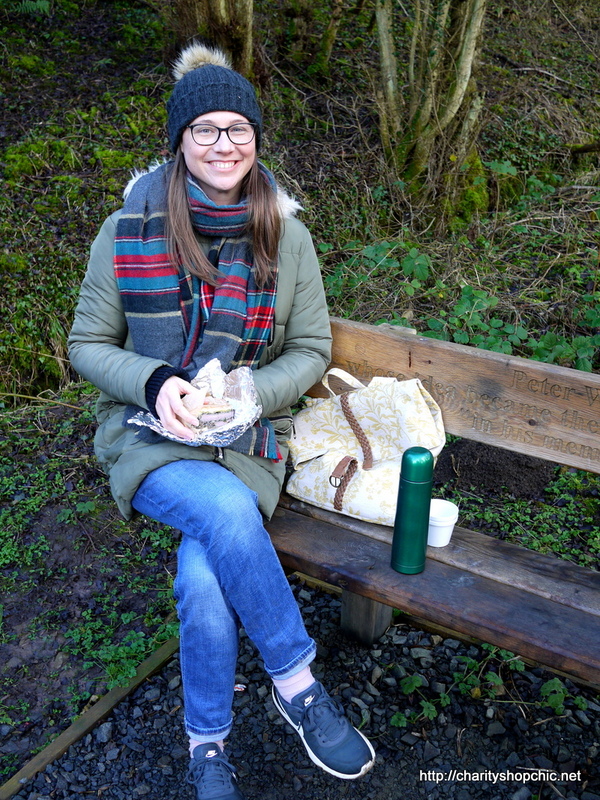 The rucksack proved perfect for carrying a picnic and my overnight bits, with ample room for my hat and mittens when they weren’t needed. 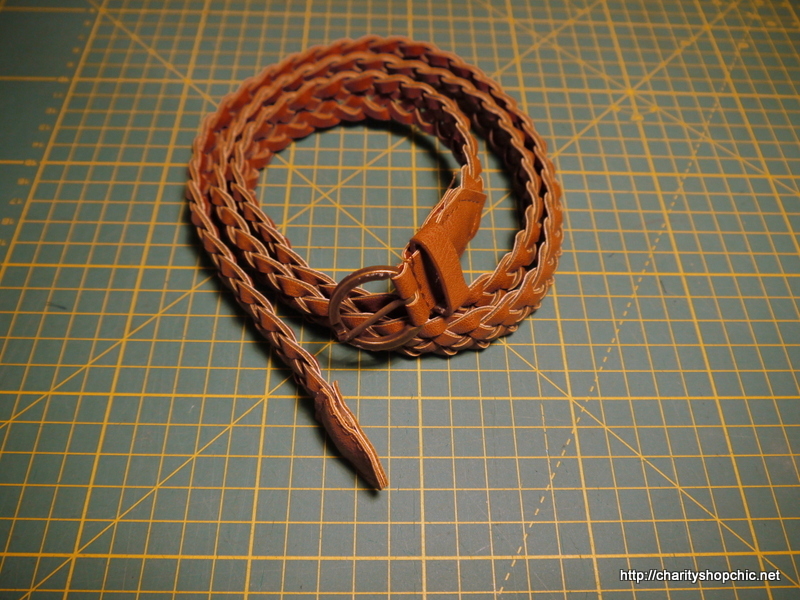 I would like to rethink the join between the padded part of the strap and the belt part if I make another one, but it works well enough, and it’s comfortable and lightweight to carry. For my first time making a bag, I’m happy! You should be so happy – this bag is just lovely! I have so many pieces of upholstery fabric squirrelled away that I should do something similar, but it wouldn’t be as good! Thank you, Sue! I do really like it. I think it’s the perfect size for my bits and pieces. 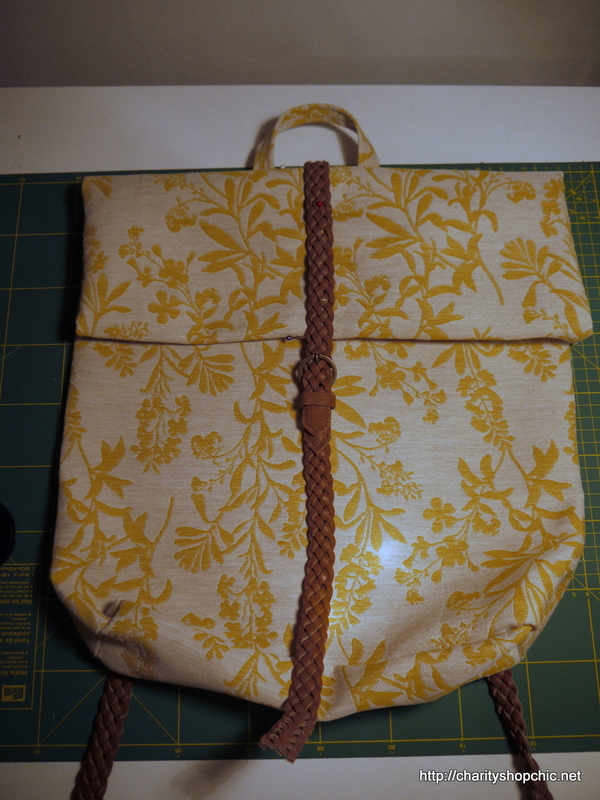 I need to come up with another way of joining the two bag strap parts together though. I would have looked into recycling D-rings and adjusters from other belts. Hi Claire, thanks for commenting! I do love finding fabric in a charity shop but unfortunately it doesn’t happen very often! Glad you liked hearing about Yorkshire too. More of that sort of thing coming up! 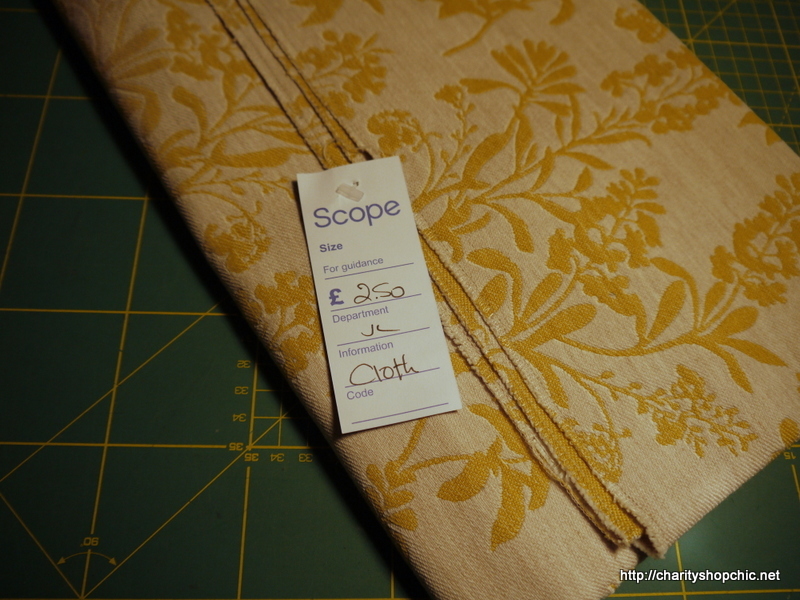 I found an AMAZING set of curtains in a charity shop near me – SO MUCH FABRIC and they were next-to-nothing to buy! 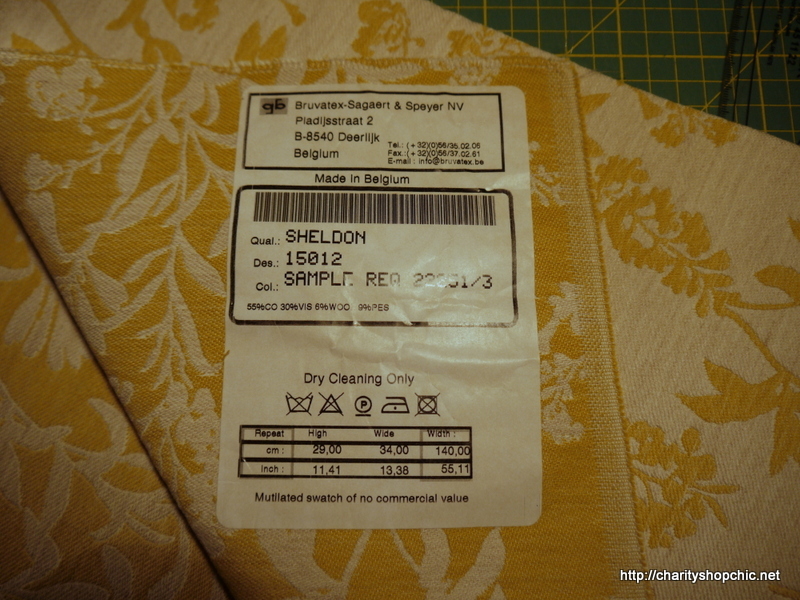 I plan on using the heavy-duty fabric to make a 50’s style evening dress. Love your resourcefulness and what a good job you did – still telling my friends about the brown and white spotty dress project! I love the bag. 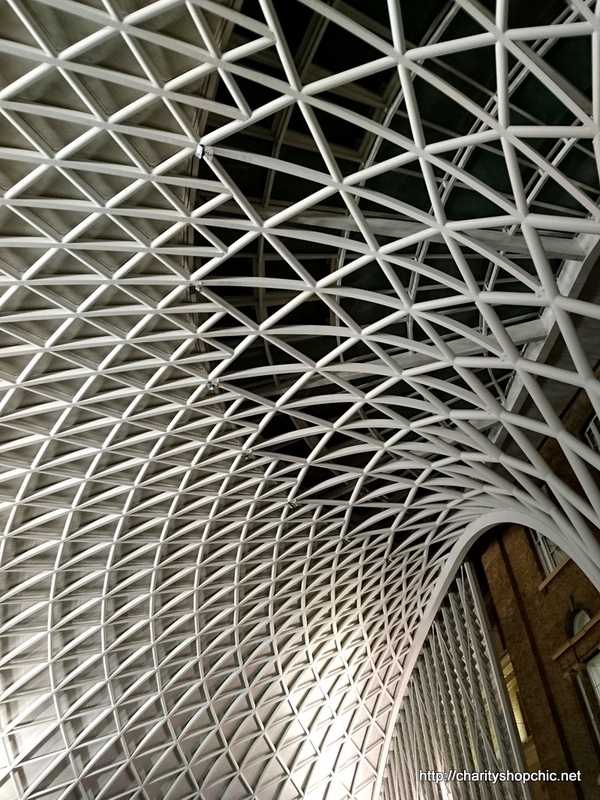 Also I am super jealous that you live so close to King’s Cross. Is it true you can dial the Ministry of Magic from the phone booth outside? Hi Rebecca, they definitely still have the luggage trolley disappearing into the wall at platform 9 3/4, and a new HP gift shop. I didn’t see the phone box but will look out for it next time! 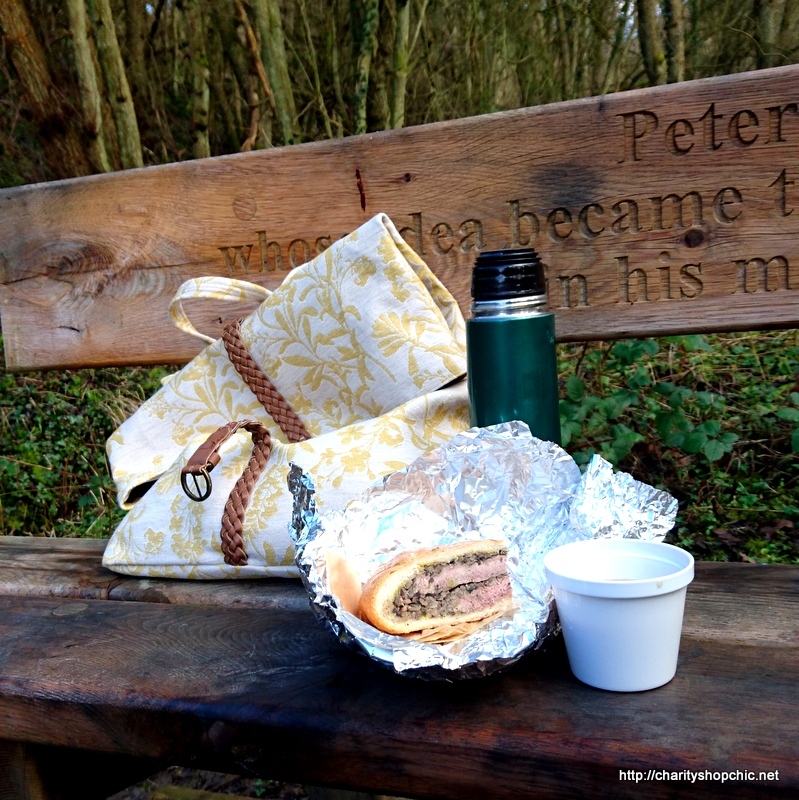 I love your repurposing blogs – yours is the only blog I ever read! My friend introduced me to them as she knows you from school and she knows me from our masters (and that I like sewing and live in Bromley). I go to a very informal dress making meet/class/social in Eden Park on occasional Tuesday evenings of a month in a newly built church hall (only £4 a sess with tea!) – I don’t know if that’s your cup of tea? Or anyone else who reads the blog but if it is let me know and I’ll share my details. 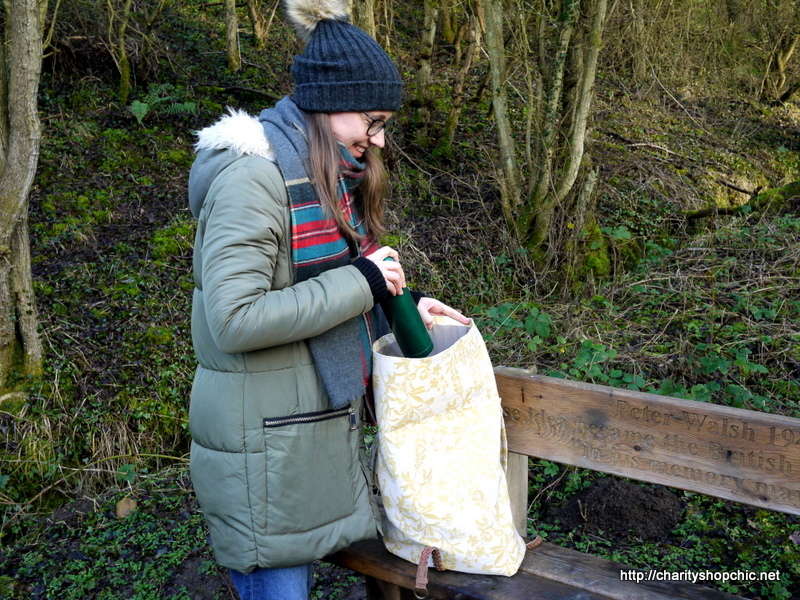 I love everything about this article – the making of the rucksack, hearing all about your trip, getting a recipe, and a history lesson too! Fabulous – thank you! It’s a bit of a brain-dump but I’m glad someone liked it :) Thank you for reading, Heather! 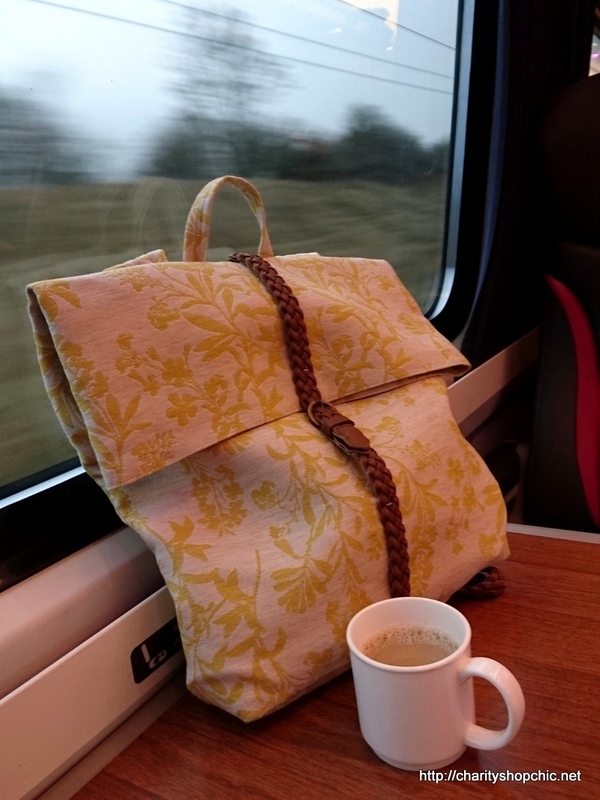 This is a very pretty rucksack and such a good idea to use up upholstery fabric. I have some myself, bought for next to nothing in a jumble sale because it was fabric and because it was there, but up to now no ideas what to do with it. Sally you are just too clever! Who would have thought to use a belt as the strap, so perfect. I can never find fabric in the charity shops, you have such a good eye! 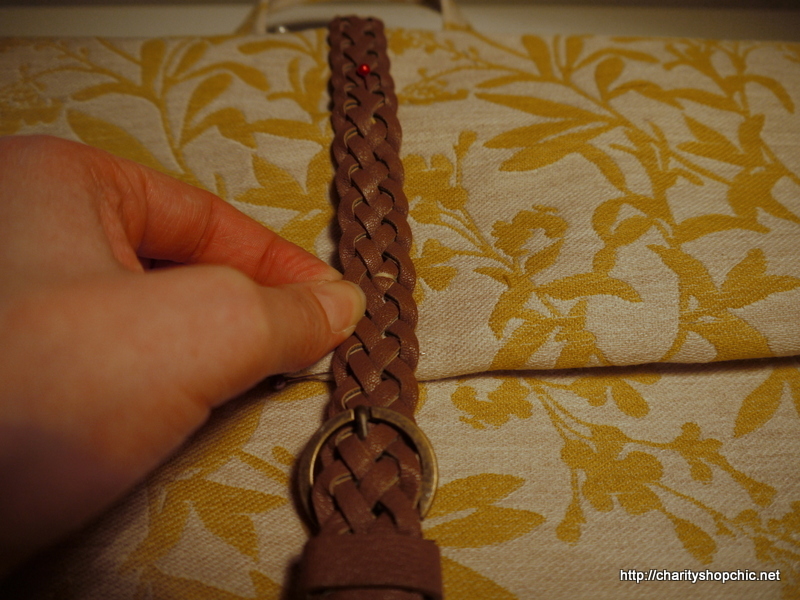 An easy way to sew the belt/strap into the shoulder strap is to hem the opening of the shoulder strap. 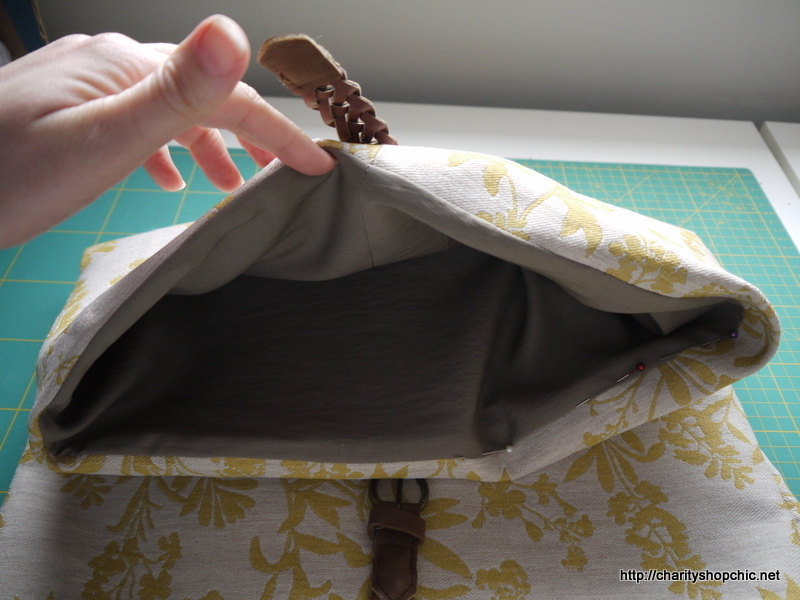 Turn up the raw edge 1/2″ (12mm) on both shoulder strap end pieces (press, glue, or baste), topstitch the long strap edges as you did, and when done, you will have a clean finished opening to easily insert and “box stitch” the belt/strap securely. I love this! You can’t even tell it was a belt in a past life. It goes great with the fabric. What a great idea, I would never think to do this but it looks amazing and is original too which is even better! I love it! You are clever. 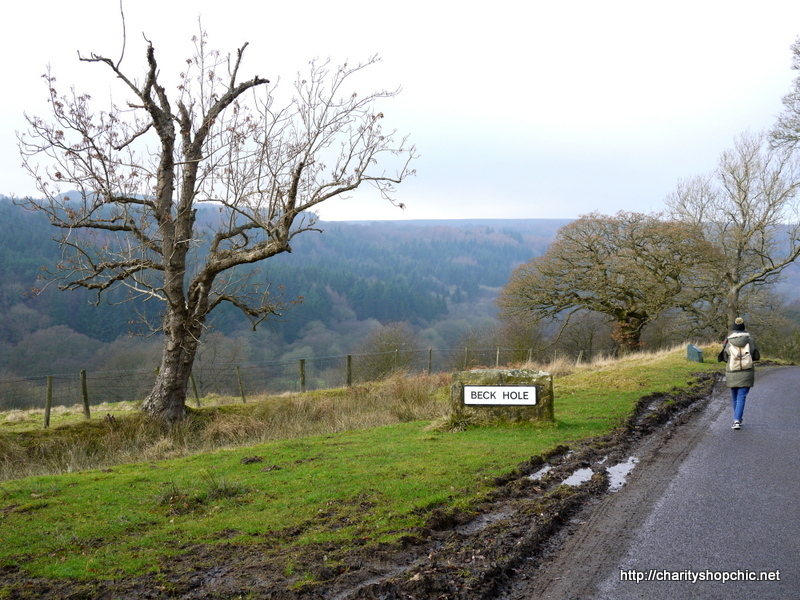 I also went to Goathland AND Beck Hole about 2 weeks after yoU! I love your post. All these rucksack are awesome. I am looking for buying something for charity. Your stuff is quite helpful. Thanks for sharing this useful blog. Aren’t you getting Spring creative? What’s going on in your exciting life? I want to live vicariously.